Bryan M. Cantrill (born 1973) is an American software engineer who worked at Sun Microsystems and later at Oracle Corporation following its acquisition of Sun. He left Oracle on July 25, 2010 to become the Vice President of Engineering at Joyent and is currently Chief Technology Officer at Joyent. Cantrill was born in Vermont, later moving to Colorado, where he attained the rank of Eagle Scout. He studied computer science at Brown University, spending two summers at QNX Software Systems doing kernel development. Upon completing his B.Sc. in 1996, he immediately joined Sun Microsystems to work with Jeff Bonwick in the Solaris Performance Group. In 2005 Bryan Cantrill was named one of the 35 Top Young Innovators by Technology Review, MIT's magazine. Cantrill was included in the TR35 list for his development of DTrace, a function of the OS Solaris 10 that provides a non-invasive means for real-time tracing and diagnosis of software. Sun technologies and technologists, including DTrace and Cantrill, also received an InfoWorld Innovators Award that year. In 2006, "The DTrace trouble-shooting software from Sun was chosen as the Gold winner in Wall Street Journal's 2006 Technology Innovation Awards contest." In 2008, Cantrill, Mike Shapiro and Adam Leventhal were recognized with the USENIX Software Tools User Group (STUG) award for "the provision of a significant enabling technology." Together with Shapiro and Leventhal, Cantrill founded Fishworks, a stealth project within Sun Microsystems which produced the Sun Storage 7000 Unified Storage Systems. He left Oracle on July 25, 2010 to become the Vice President of Engineering at Joyent. He is currently Chief Technology Officer at Joyent. He was a member of the ACM Queue Editorial Board. During an online technical discussion of Solaris with Linux kernel developer David S. Miller in 1996, Cantrill responded to Miller's lengthy comment with a one-line reply, "Have you ever kissed a girl?" In 2015, during a discussion concerning Ben Noordhuis's departure from the Node.js project, Cantrill said that the 1996 comment continues to be cited, decades later, and wrote about his regrets in sending the response, which he called "stupid". After Cantrill left Oracle in 2010 he used very strong analogies multiple times to describe his point of view on Oracle's business behavior. Cantrill announced at FISL 2012 his strong preference for permissive open source software licenses over copyleft licenses by calling the copyleft GPL license family "anti-collaborative" and "viral." Bryan Cantrill (2006-02-01). "Hidden in Plain Sight". ACM Queue. 4 (1): 26–36. doi:10.1145/1117389.1117401. Retrieved 2012-02-01. Bryan Cantrill, Jeff Bonwick (2008-09-01). "Real-World Concurrency". ACM Queue. 6 (5): 16. doi:10.1145/1454456.1454462. Retrieved 2012-02-01. Bryan M. Cantrill, Michael W. Shapiro and Adam H. Leventhal (2004-06-10). "Dynamic Instrumentation of Production Systems". Proceedings of the 2004 USENIX Annual Technical Conference. Retrieved 2012-02-01. Bryan M. Cantrill, Thomas W. Doeppner (1996-08-15). "ThreadMon: A Tool for Monitoring Multithreaded Program Performance". 30th Hawaii International Conference on System Sciences (HICSS) Volume 1: Software Technology and Architecture. Retrieved 2012-02-01. ^ Bryan Cantrill (2010-07-25). "Good-bye, Sun". ^ Bryan Cantrill (2010-07-30). "Hello Joyent!". ^ Cantrill, Bryan. "From VP of Engineering to CTO". dtrace.org. Retrieved 17 April 2014. ^ Neil McAllister (2005-08-01). "DTrace and Predictive Self-Healing herald Sun's future". InfoWorld. Archived from the original on 2012-12-17. ^ Michael Totty (2006-11-11). "The Winners Are..." The Washington Post. ^ "STUG Award". USENIX. 2008. 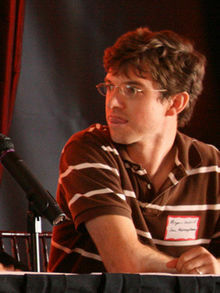 ^ Bryan Cantrill (2008-11-10). "Fishworks: Now it can be told". ^ "ACM Queue Editorial Board". ACM. Retrieved 2012-02-01. ^ "Re: But why?". 1996-10-29. Retrieved 2016-12-17. Have you ever kissed a girl? ^ "on: How One Stupid Tweet Blew Up Justine Sacco's Life". Hacker News. 2015-02-13. Retrieved 2016-12-17. I was young, and it was stupid -- and I regretted it shortly thereafter [...] the first thing I would do would be to look [David] in the eye and apologize. ^ Bryan Cantrill. "Bryan Cantrill from Joyent on Manta: internet-facing object storage facility that features compute". Hakka Labs. "and then, the Nazis invaded [...] for a while I tried to not go to Nazi allegory when talking about Oracle but I actually think that it does a dis-service to not go to Nazi allegory because if I don't use Nazi allegory when referring to Oracle there's some critical understanding that I have left on the table"
^ Bryan Cantrill on twitter If you were an enterprise database customer who hadn't heard of the Nazis, might it be easiest to explain them with Oracle allegory? "DTrace Review". Google Tech Talks. 2007-08-15.